We are include JKreativ themes with several plugin. Those plugin is tested and modified to fit with this themes. If you’re using another plugin that not come with this themes, you will need to do some custom change on plugin or themes so it can work perfectly. For more detail information about installing required plugin you can take a look right here. Note Please Note : Only enable plugin that you really need to make site load faster. This plugin is the main pugin for JKreativ themes and it’s mandatory to install. Because of new rule on Themeforest we need to separate themes styling and functionality that mean to be placed on plugin. You will not see any portfolio post type, or landing slider type, metabox or any other functionality that should be integrated with the themes if you not install and activate this plugin. You mandatory to install this plugin. 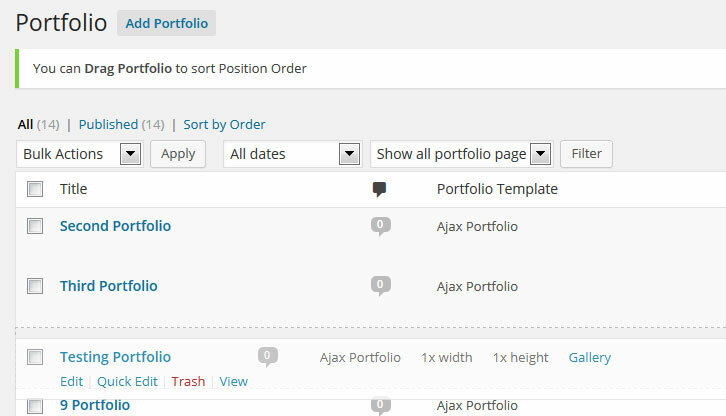 Themes will use this plugin for easier sort of your portfolio. This plugin is required to install for your themes. This plugin will check for any retina device, and trying to replace image if retina image available. Jkreativ theme comes with mega menu feature that implemented custom version of “Mega Main Menu” plugin. You can follow this instruction below to using Mega Main Menu. Make sure Mega Main Menu plugin is installed & activated. side_navigation : Check this option to enable mega menu on side navigation / vertical navigation. top_navigation : Check this option to enable mega menu on top navigation / horizontal navigation. Location Of Icon In First Level Elements : Choose where to locate icon for first level items. Separator : Select type of separator between the first level items of this menu. Rounded Corners : Select the value of corners radius. Dropdowns Animation : Select the type of animation to displaying dropdowns. Warning : Animation correctly works only in the latest versions of progressive browsers. If you don’t see any menu that you can activated, please go to : Appearance → Menus and create menu. Also please assign your menu on Side navigation or Top navigation, so you can assign it on Mega Main Menu. After activate mega menu on Mega Main Menu option, next step is setup menu structure from Menus. Icon of This Item : Set this if you wish to add icon for this menu item. Hide Icon of This Item : Check this option if you want to hide icon. Hide Text of This Item : Check this option if you want to hide text. Disable Link : Check this option if you want to disable link. Submenu Type : Select Multicolumn Dropdown to make menu have multi column child (Mega Menu) or Standard Dropdown option. Submenu Columns : Number of columns of mega menu on this item. Additional Right Padding : Add space at right side of menu item. Additional Bottom Padding : Add space at bottom side of menu item. Dropdown Background Image : Add image for menu background. 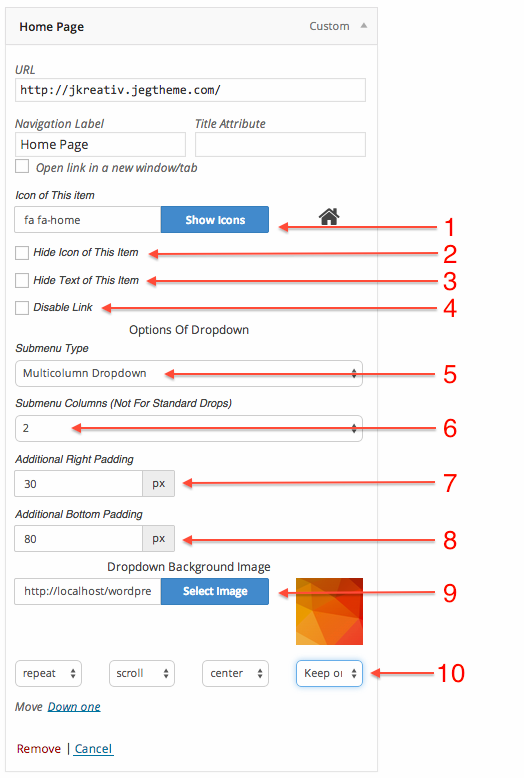 Dropdown Background Image options : In this option you will be able to setup several option for dropdown background image. This plugin is optional to use for JKreativ themes. Revolution slider is on of most popular slider on Themeforest, you can use this slider for header of landing page. Information about Revolution Slider, you can see on Revolution Slider documentation right here. Contact form 7 is one of the most popular plugin to build form on WordPress. This plugin is optional to install, you can use another contact form plugin if you are not feeling that this plugin not enough to cater your need. For more detail information your can take a look right here. Visual Composer is a fantastic plugin that adds a drag & drop page builder to your WordPress theme. If you new to Visual Composer, get started how to use Visual Composer you can take a look right here. This plugin is required for page builder. If you planing to show your product and sell something inside your website, you have option to do this. For more information how to use this plugin please refer to this link.